On November 8, 2013, Typhoon Haiyan made landfall in the Philippines, causing widespread devastation. The next day U.S. Senator Robert Menendez said the United States should “do everything in our power to assist our friend and ally in dealing with the devastating consequences of this storm, and to help meet the needs of the Filipino people in addressing this disaster.” President Obama echoed these thoughts as he pledged U.S. government assistance and logistical support. While these sentiments sound good and are common after natural disasters, large-scale state-led humanitarian relief efforts are often messy in implementation and full of unintended consequences that cause more harm than good. The question is how such well-intentioned actions could fail to produce good results. In Doing Bad by Doing Good, Professor Christopher Coyne of George Mason University seeks to answer this question by providing a positive economic analysis of state-led humanitarian efforts. Acting as a continuation of his previous book, After War: The Political Economy of Exporting Democracy, which analyzes the efforts of outside nations trying to establish democracy in post-conflict areas, Coyne explores why “well-funded, expertly staffed, and well-intentioned [state-led] humanitarian actions fail…to achieve their desired outcomes” (6). The book is not designed as “a ‘how-to’ guide for humanitarian action” but instead focuses “on the limits of human reason to clarify the boundaries of what governments can do to help those in need” (25). The book is divided into three sections. The first section (chapters 1 and 2) sketches the mindset of the typical humanitarian actor and provides a brief history of humanitarian action. The second section (chapters 3-6) applies the economic way of thinking to evaluate the limits and realities of state-led humanitarianism. The last section (chapters 7-8) revisits the typical humanitarian actor from the book’s first section and offers a more constrained and realistic vision of humanitarian action. This review will provide a brief description of each chapter. In the opening chapter, Professor Coyne introduces the reader to some key terms. First, he defines humanitarian action as “any coercive or noncoercive action intended to alleviate potential or existing human suffering and to improve the human condition” (18). This broad definition allows Coyne to examine short-term emergency relief assistance, long-term development assistance, and humanitarian-minded military action under one conceptual umbrella. The definition also distinguishes Coyne’s analysis from earlier critiques of humanitarian action, which fall into two categories: short-term emergency and long-term structural assistance. Second, state-led humanitarianism “implies that a government or group of governments plays a leading role as the agenda-setter in designing, implementing, funding, or overseeing the humanitarian effort” (19). While the author acknowledges that the line is sometimes blurred between state-led and privately-led humanitarianism, especially when nongovernmental organizations (NGOs) are involved, Coyne argues that since World War I, the state has become the central actor in humanitarian aid. The first chapter also introduces the reader to the man of the humanitarian system who believes that “improving the human condition is a purely technological problem” which “downplays the complex economic, legal, and political systems underpinning the effectiveness of designed organizations and institutions” (16-17). According to Coyne, this mindset is pervasive in state-led humanitarianism and it gives policymakers “an inadequate model of the actual world” (21). The man of the humanitarian system is the heart of Coyne’s analysis. Firmly planted within a Hayekian framework, Coyne argues that state-led humanitarianism fails to deliver as promised because humanitarian policymakers and practitioners face knowledge constraints and the political spheres they operate in provide the wrong incentives for successfully administered aid. Like all resources, humanitarian resources are scarce and the knowledge needed to allocate these resources among competing and alternative ends is dispersed. Policymakers and practitioners who fail to account for the myriad of complexities involved in allocating humanitarian assistance invite unintended consequences from their actions. Making matters worse, political institutions incentivize policymakers to “secure control over more resources of power”, invite mission creep, and encourage “overly ambitious goals that extend well beyond the limits of what is theoretically possible for humanitarian action to accomplish in practice” (24). The second chapter is divided into three sections: a brief history of how humanitarian assistance has evolved over time, evidence supporting the growth of the state in the humanitarian space, and a short review of the evidence surrounding the performance of state-led humanitarianism. State-led humanitarianism budded after World War I, blossomed after World War II, and became the dominant force of humanitarianism by the end of the Cold War. Coyne attributes this growth to a few factors: the establishment of the United Nations (UN), the process of decolonization, the rise of national income accounting, the human suffering witnessed as a result of the World Wars and the worldwide economic decline in the 1930’s, and the expansion of the UN Security Council’s definition of threats to international peace. Coyne argues the expanded role of governments in humanitarian activities has had two effects. First, the range of activities governments consider humanitarian has grown. Second, governments have dramatically increased the amount of resources dedicated to these expanded activities. Examples include the growing budget (regular and peacekeeping) of the UN, the expanding number of UN peacekeeping operations (and the increasing number of peacekeepers involved), the adoption of humanitarian concerns into the defense strategies by militaries, the increase of inflation-adjusted foreign aid spending (and the number of foreign aid projects), and the increased reliance NGOs have on state funding. The last section of chapter two briefly considers the success of state-led humanitarianism. Unfortunately, the answer is ambiguous because of a handful of problems. First, the activities of state-led humanitarianism are growing, making evaluation difficult. Second, there is no common definition of success. Third, humanitarian aid is often given in times of crisis, making data collection difficult (specifically the collecting of comparable baseline data ex ante by researchers). Lastly, the ceteris paribus requirement is almost never met, making it hard to isolate the effects of individual policies. Coyne concludes that “there is no single, definitive answer concerning how well state-led humanitarian action has performed as a whole” (57). The third chapter analyzes the adaptability of humanitarian actors. Adaptability is “the ability of people and organizations to learn from their mistakes and make the necessary changes to be successful” (62). According to Coyne, when actors in the humanitarian space are not adaptable, “resources are sitting idle, being used ineffectively, wasted, or harming those they are intended to help, [and] more resources will not change the outcome absent feedback and the incentive to adapt accordingly” (63). Adaptability is absent because humanitarian resources, which are scarce, are allocated outside the market system through central planning. Central planning dominates humanitarian thinking for four reasons. First, many policymakers and humanitarian practitioners view markets with suspicion. Second, many of these policymakers and practitioners fundamentally misunderstand how markets coordinate scarce resources towards mutually beneficial outcomes that increase value to society. Third, governments are bureaucratic in nature and the growth of state-led humanitarianism is making humanitarian aid more bureaucratic. Lastly, in some areas where humanitarian resources are allocated, well-functioning markets are often absent or perverted. Professor Coyne argues humanitarian actors fail to adapt to complex situations because of the “planner’s problem” (i.e. they lack the knowledge and the incentives to adapt). Without market signals like prices (e.g. profits and losses) humanitarian resources are allocated inefficiently and in such a way that does not maximize economic value. While humanitarian assistance can increase output, it “does not answer the relevant economic questions” because “finding an answer to these questions requires economic calculation, which is absent in centrally planned humanitarian action” (75). Simply put, Professor Coyne doubts that humanitarian assistance furthers economic development precisely because it cannot replicate the countless interactions that take place between the millions of economic participants on a day to day basis. The third chapter ends by describing the “outer limit, or best-case scenario” (88) of humanitarian action. Humanitarian activities “can potentially increase the availability of short-term, relief-oriented goods and services…but it cannot solve the economic problem, which is what is required for wealth creation and society-wide economic progress” (88). Professor Coyne suggests that humanitarian actors should be more humble in their endeavors. Chapters four and five use the “political economy” model of the political process to explain why state-led short-term emergency aid often fails to deliver relief to the vulnerable. In both chapters, Coyne assumes policymakers and humanitarian practitioners are self-interested and that “the allocation of resources is not influenced directly by the final recipient but by the various groups seeking to secure available funds” (94). Chapter four examines what happens to humanitarian aid when it is allocated through political rather than economic markets. The main takeaway is that using the political process “does not remove competition over the allocation of scarce humanitarian resources; instead, political competition replaces market competition” (92). The distribution of humanitarian aid through political markets increases competition in recipient governments (which may increase corruption, particularly in countries with weak institutions), donor governments (causing mission overlap among competing government bureaus charged with aid allocation), NGOs (resulting in the “NGO scramble”), and special interest groups (increasing tied aid). Instead of humanitarian resources flowing to those most in need, political incentives ensure that “political participants with the most influence and power determine who gets what” (101). Chapter five explores the bureaucracy of state-led humanitarianism. Coyne defines bureaucracies as “all nonmarket forms of organization,” including government agencies and private nonprofit organizations (109). These bureaucracies share two key characteristics. First, bureaucracies receive personal income that is not tied to net revenues. Second, the revenue of bureaucracies comes from appropriations, not selling output. These characteristics help explain why bureaucracies evaluate their performance and worth by the size of their discretionary budget and the number of bureaucrats employed by a particular agency. Using this economics of bureaucracy model, Professor Coyne argues that bureaus engaged in humanitarian work follow three tendencies. First, these bureaus will “invest resources in creating demand for their goods and services” (111). Second, in order to access additional funding, bureaus will engage in mission creep. Lastly, the incentive to increase the discretionary budget encourages spending activities rather than cost-saving activities. Constraints on information transmission and the presence of the principal-agent problem also plague bureaucracies, decreasing their ability to effectively administer aid by slowing communication, adding compliance costs (i.e. red tape), and information asymmetries. Adaptability requires feedback and aid recipients (the principal) are unable to provide feedback to humanitarian bureaucracies (the agent) because aid is allocated outside the market system. Solutions to the principal-agent problem, including aid conditionality (i.e. tied aid), increased transparency, and centralization often fail. The chapter ends with a discussion of why bureaucratic reform often starts with grandiose promises to reform but often end with little actual changes. Reformers often underestimate that bureaucracies have little incentive to reform. Reform by definition requires change and some changes may narrow a bureau’s objective or even eliminate the bureau. Those working in these bureaus have the incentive to resist these reforms and when reforms are adopted, they “add to the existing bureaucratic structure instead of altering the fundamental structure itself” (134). In chapter six, Professor Coyne argues against the linear technocratic thinking of the man of the humanitarian system. According to Coyne, the typical humanitarian actor believes that “problem situations can be neatly defined, appropriate solutions can be devised by experts, the relevant inputs to achieve the desired outcomes can be determined, and the plan can be implemented as designed” (146). This type of thinking leads to system effects (i.e. unintended consequences) because it ignores the complex systems (e.g. economic, legal, political, and social) humanitarian aid must work through. Coyne identifies three reasons why system effects occur in complex systems. First, any intervention into a complex system will have indirect effects that may only become evident in the long-run. Second, interactions within complex systems typically involve more than two parties, which increases transaction costs. Lastly, complex systems are not additive, so system outcomes cannot be understood as the sum of the individual parts. The presence of system effects has three implications. First, aggregate outcomes do not necessarily follow smaller individual actions. Second, people behave purposively so their actions affect the actions of other in the present period. Lastly, since the behavior of people change in the present period because of system effects, outcomes in a future period will also change. Using the above framework, Professor Coyne outlines four general categories of negative system effects from state-led humanitarian work. First, humanitarian assistance can perversely affect the decision making of aid recipient countries. For example, aid gives recipient countries little incentive to reform its internal institutions for wealth creation because aid is a substitute for tax revenue. Second, aid may create a culture of dependency in the recipient country, discouraging private investment, and encouraging risky behavior because aid masks the true costs of risky behavior. Third, aid may create or escalate conflict because the aid often ends up in the hands of those causing the conflict. Lastly, aid may inadvertently increase crimes committed by humanitarian workers at the expense of the aid recipients. Given these system effects, Coyne ends the sixth chapter with some implications regarding humanitarianism. First, humanitarianism is always more complicated than it first appears. Second, humanitarian actors need to “move from thinking in terms of ‘what should we do’ to thinking in terms of ‘what can we do” (164). Lastly, humanitarian actors must understand that their ability, and therefore their actions, is limited. As illustrated throughout the book, failing to understand these limitations causes negative unintended consequences. Chapter seven is a brief chapter that reinforces the previous chapters: “The dominance of the man-of-the humanitarian-system necessarily neglects the economics of humanitarianism” and the “result is overly ambitious efforts that ignore constraints and the limits of human reason” (175-176). Coyne illustrates this point using examples from U.S. humanitarian projects in Afghanistan that stretched between two intervals, 1950 to 1979 and 2001 to the present. In both time periods, humanitarian efforts have failed to transform Afghanistan into a successful political and economic nation state. The last chapter revisits the man of the humanitarian system and offers the “constrained approach,” which is “a more modest, yet more realistic, vision of [humanitarianism]” (177). The constrained approach recognizes human imperfections and limitations as constraints that must be recognized before action is taken and asks what can be done rather than assuming something must be done. When starting from this mindset, “heavy emphasis [is placed] on adaptability, including the presence, or absence, of effective mechanisms to generate appropriate feedback, as well as the existence or absence of appropriate incentives to act on that feedback” (179). Using the constrained approach, Coyne argues that development is “an ongoing process of discovering new and improved allocations of scarce resources” (179). Therefore, economic development needs an atmosphere that fosters entrepreneurial activity, recognizes endogenous rules, and removes barriers to discovery. Rather than relying on top-down and exogenous approaches to development, which suffer from the “planner’s problem,” the constrained approach provides opportunity for individuals to flourish through the process of discovery. Unfortunately, the constrained approach of humanitarianism may not displace the man of the humanitarian system mindset because of the “existing gargantuan state apparatus – domestic and international – that has the express purpose of engaging in humanitarian action” (192). These vested interests profit from the current system, financially, in prestige, or both, so they have little incentive to change. Making matters worse, the more intertwined private humanitarian agencies and NGOs become with the state, the more entrenched the status quo becomes. Fortunately, the book ends with an optimistic vision of the future regarding humanitarian aid. Coyne identifies multiple reasons why the constrained approach to humanitarianism may still yet prevail. First, global economic freedom is expanding, providing more room for entrepreneurs to find solutions to humanitarian crises. Second, global violence and brutality are falling, both of which are goals of humanitarianism. Third, a private humanitarian sector, both for profit and not-for-profit, is growing. Lastly, those sympathetic to the constrained approach (e.g. the author, William Easterly, and Dambisa Moyo) are no longer ostracized from the humanitarian debate, allowing for a more robust discussion on how to best serve the global poor. 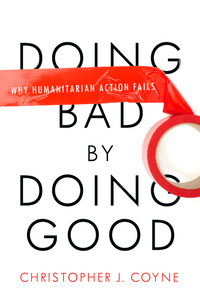 Doing Bad by Doing Good is a readable treatment of why well-intentioned humanitarian assistance is often less successful than promised and can lead to negative unintended consequences. As state-led humanitarianism continues to grow and as NGOs and the private humanitarian sector become more reliant on government funding to execute their missions, the lessons provided by Professor Coyne will only increase in importance. The book’s greatest strength is its simple message: humanitarian actors do not have enough information nor the correct incentives to efficiently allocate scarce humanitarian resources. This message is reinforced in every chapter. The lack of technical language does not mean the book is simple minded. Clear and simple economic reasoning helps provide deep insight into complex problems rather than muddling them. By reinforcing basic economic principles, this book does not suffer from the hubris of so many other books on development that promise an easy solution as if everyone could be moved like pawns on a chessboard. This lesson becomes even more important in extraordinary circumstances, exactly when humanitarian assistance is given. The book’s second primary strength is its accessibility. While the academic literature in economic development is often technical and aimed towards scholars, this book does not use technical language or complicated graphics to underscore its thesis. Therefore, readers are not required to understand economic theory before understanding the book’s main points. This is seen, for example, in chapter three when economic calculation is explained. While scholars will find value in the book, non-scholars, including students, will also feel welcomed. The book’s last strength is its honesty. Too many books evaluating development assistance lead the reader to believe that solving worldwide poverty is a matter of taking the right steps and having the right attitude and determination. Professor Coyne calls for more humility and stresses that economic development is a discovery process that involves millions of interactions, many so small that they seem inconsequential. However, only through these interactions, and the feedback provided to market participants through the price system, will societies create goods and services that people value. Until humanitarian actors accept this, and only after they accept that they have limited knowledge of complex situations, will development assistance be put in its proper place. Cynics of Coyne’s analysis, and specifically his conclusions, may reason that this book is just another anti-foreign aid book that fails to consider the plight of the poor. However, these cynics have missed the author’s deep desire to help the poor. The driving force behind Coyne’s analysis is that well-intentioned state-led humanitarianism may lead to the unintended consequence of making the poor and underprivileged worse off, a morally unacceptable outcome that should be avoided. As the title of the book suggests, motives do not matter, results do. Despite the book’s strengths, the book suffers from two primary weaknesses. The first and main weakness is the artificial separation between normative and positive economics. This is best seen in the first chapter when Coyne writes, “As an exercise in positive economic analysis, this book has nothing to say about moral obligations – what ought to be done – regarding humanitarian action…” (26). While this separation is often invoked in economics, the distinction is not clear. First, positive assessments are always interpreted within a prior normative framework (i.e. a worldview). Second, positive assessments often affect the normative framework a person adopts. For example, Professor Coyne adopts efficiency as the ultimate criteria to judge the success of humanitarian aid. Whether admitted or not, this is a normative choice and the evidence of humanitarian aid is interpreted through this lens. A second example of this line of thinking is found on the last page of the book. Coyne writes, “This book has been an attempt to make clear that the issues surrounding humanitarian action are fundamentally of an economic nature and therefore require economic answers” (204). This assertion only makes sense if you accept the premise that normative and positive analysis are separate entities. While judging how well humanitarian assistance has achieved its stated outcomes fits naturally within the tools of economics, the concept of humanitarianism is a moral concept. Philosophy, ethics, and religion all should have a large voice as to whether the acts of humanitarianism in and of themselves are moral. Admittedly, Professor Coyne tries to alleviate this criticism in the first chapter by adopting the principle of “whoever can, should” from political philosopher Michael Walzer. That is, “in order to understand the should, we first need to understand the can” (26). However, is this true? Is it not equally plausible to say that society should help those less fortunate, because it is morally obligated, but do so efficiently so as to not cause waste and negative unintended consequences? This second way of thinking would not change the author’s analysis, invalidate his legitimate concerns with how humanitarian assistance is given, or reject his call for humility in understanding the limits of what humanitarian assistance can do. Just because something cannot be done perfectly does not mean there is no moral obligation to try. However, when society tries, the lessons from this book should be at the forefront of its thinking. A second weakness of the book is chapter seven. While the chapter evaluates the man of the humanitarian system using the lessons learned from the previous three chapters and offers a better way forward, the chapter interferes with the flow of the book without offering much in return. Professor Coyne could have folded the chapter contents into other chapters. For example, Table 7.1, a two page table comparing and contrasting quotations regarding the U.S. development experience in Afghanistan over time easily could have finished chapter one or opened chapter eight. Humanitarian crises are unlikely to disappear in the future so attempts to alleviate the pain and suffering caused by these crises will be present. Therefore, considering the limitations of action is essential if humanitarian assistance is to be effective. At its core, Doing Bad by Doing Good analyzes these limitations and calls for more humility by humanitarian actors. Doing Bad by Doing Good is a welcome addition to the scholarly literature analyzing development assistance. While there are numerous books that evaluate whether development assistance is successful in advancing economic development, this book provides a simple, yet elegant analysis of why external aid may be unsuccessful. This book is a must read for humanitarian practitioners, policymakers, and scholars researching and applying development assistance and is also highly recommended for anyone teaching classes in economic development or foreign aid. Anyone with a book by Jeffrey Sachs, Paul Collier, or William Easterly should also have this book from Christopher Coyne in their library. Full Disclosure: Professor Coyne acted as co-chair of Professor Pincin’s dissertation committee in 2011. In the preface, Professor Coyne suggests both books should be viewed as complements investigating the broad view of the viability of state-lead interventions. For more information see the “Responsibility to Protect” (R2P) doctrine in the International Commission on Intervention and State Sovereignty (ICSS) 2001 report The Responsibility to Protect. The NGO scramble is the process of NGOs “engaging in rent-seeking activities to secure as much funding as quickly as possible” (97). This scramble encourages NGOs to dedicate more resources towards securing future funds rather than using their resources to help the needy. For example see William Easterly’s White Man’s Burden, Jeffrey Sachs’ The End of Poverty, Dambisa Moyo’s Dead Aid: Why Aid Is Not Working and How There Is a Better Way for Africa, and Paul Collier’s The Bottom Billion.